What I got last weekend? No, wait, I've never taken a picture of my feet and bag and office attire - so here it is. It began with spending too much time at home, to be honest. Pantang ruined my life for sure - I couldn't go out at all hence getting important stuff at such an important time was crucial (e.g when I woke up soaked in breast milk in the early days of breastfeeding and my supply of breast pad either ran out or in the laundry; and the baby store is a couple of blocks away) so I had to rely on online stores for the stuff I need. Made my husband buy maternity pads and nursing bras for me in the early days, too. No kidding, he was bright red when he reached home. Kesian lol. So I resorted to internet. So after a while, I got used to getting some stuff at my doorsteps during pantang. But those are still fine cause they're essentials. But problem is, started working, I still go online and go out to physical store, too. Butttt here's the justification - they're essentials! I needed a breastpump bag and a cooler bag at first (because I've been pumping milk at work now WTF I know I don't know who I am anymore) and then I got one, but then I learned that bringing two bulky bags to work is really not convenient. So I needed a big bag to bring my laptop and the pump bag too - hence the big leather tote from Zara. And to be honest, I'm loving big bags now - this bag accommodates everything in my life. 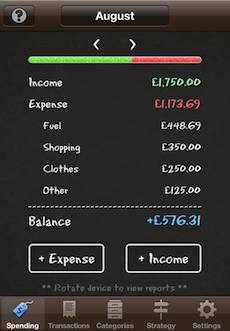 A spending tracker app for iPhone. Super helpful provided that you diligently use it every day - I've been tracking how much I've spent for lunch now, I'm thinking of bringing bentou to work. Who needs Excel now that we have this app at the tip of our fingers. Even managed to impress the husband too. Shahrul now diligently uses it (even more than I do) and our daily activity at night is comparing each other's spending tracker - so I can't cheat haha. But it's a good practice, at least to me. Now I know NOT to spend more on lunch, and have been bringing my own breakfast to work every day. Baby steps!